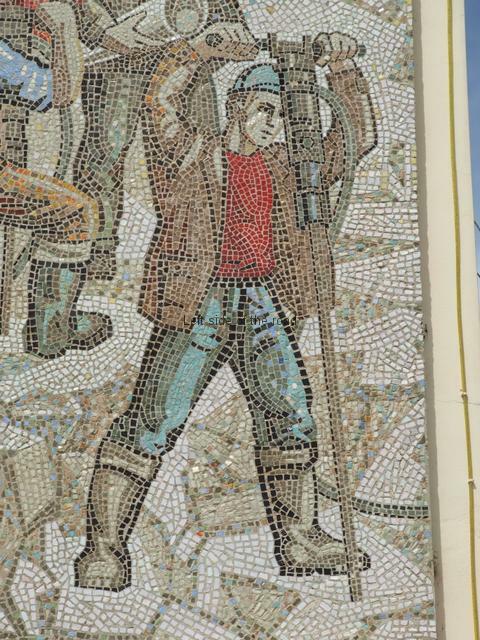 The more I see of them the more I like the mosaics that were created in the Socialist period of Albania’s history. In many ways they capture a feeling of optimism and hope for the future which other art forms just can’t achieve. Yes, paintings can do that but the very scale of mosaics, out in the public view all the time, just seems more immediate. Mosaics have been around for a long time but in the past representing non-existent, mythical goods or the ‘rich and famous’. 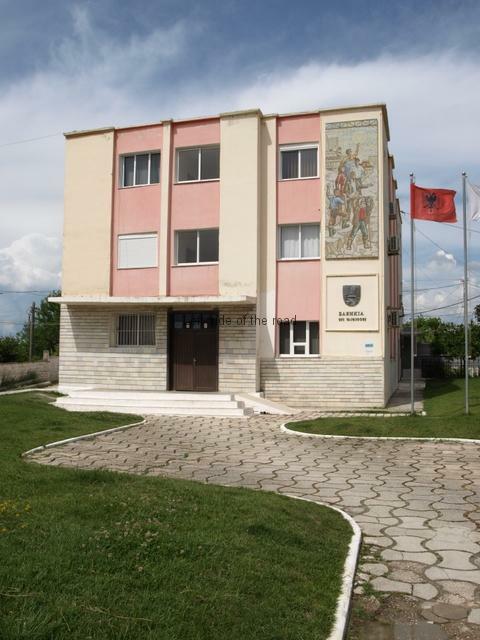 Those created in Albania in the 1970s and 1980s put the working class and peasantry into the forefront, showing that their lives are important and, if they but know it and chose to take on the task, that a better future will be theirs. Such is the mosaic on the façade of the Bashkia (Town Hall) of Ura Vajguror, between Berat and Kucove, in the centre of the country. Although the work of the Albanian Lapidar Survey has quantified most of the lapidars in the country the project had to chose when to stop and so many art works such as mosaics aren’t listed. That makes it all more of a pleasant surprise to come around a corner to be confronted by this little masterpiece. One of the roads in the centre of this small town was being pedestrianised and hence the traffic was forced to go in a different direction, offering me the opportunity to see the mosaic for the first time, although I had passed close by a number of times in the past. The Bashkia itself is a relatively modest building, a square, three storey concrete building which is made special by a subtle consideration of the entrance, with a curved approach path, a very short flight of steps up to the main door, stone work on the ground floor before the monotony of the concrete (painted in cream and pink) and this magnificent, rectangular mosaic which covers the right hand side of the building, the height of the upper two floors. Below the mosaic sits a large bronze crest of the town. However, I’m at a bit of a lost to describe exactly what it depicts and the story it is trying to tell the viewer. What is shown are six individuals (five men and one woman) standing in what looks like a quarry. The surface upon which they stand is uneven and has many levels as if rock has already been extracted. That part makes sense as there is a lot of quarrying of marble and granite throughout the country, large lorries with huge blocks of stone being a common sight on the mountain roads. Whether this marble is of the quality of the famous Carrara from Italy I don’t know, but you do see a lot of it being used all over the country. In the forefront, in the bottom right hand corner, is the only person who is actually working and we see him face on. This is one of the males who is operating a pneumatic drill with a very long bit, the sort of drill that is used to make the holes into which explosives will later be placed to crack open the mountain. Either that or making a series of holes along the length of a rock face in such number that it weakens the hold of the mountain on the rock so that it can be prised free. He wears a blue hard hat, a leather jacket over a red shirt, jeans and heavy, protective boots. He’s looking down at were his drill is positioned and is concentrating on the job in hand. To his left is another worker with a similar drill, but this time it’s not in operation. He has his back to the viewer and we see his face in profile. 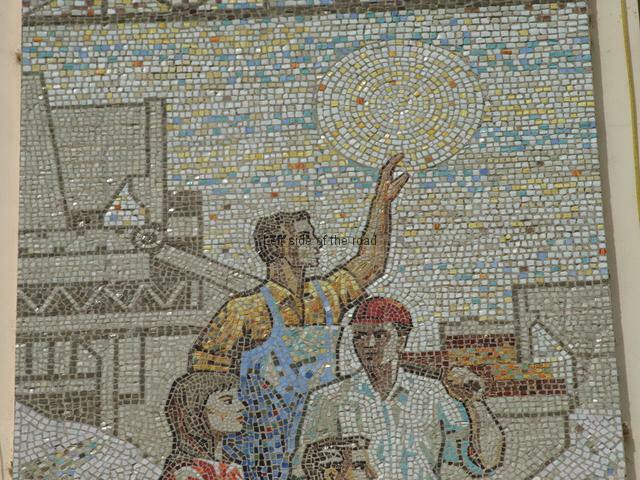 His right hand is on the drill but his left arm is raised above his head and he seems to be waving to some unknown and unseen person or persons off the mosaic. He doesn’t have a hard hat (something which would have Health and Safety representatives in the UK nowadays tearing their hair out – although it is a sad reflection on our times that safety concerns for workers in far too many countries is actually getting worse rather than better as the years go by), wears a blue shirt and brown trousers. His feet, as with his comrade, are in heavy protective boots and are on a different level, stressing the unevenness of the ground. Above and to his right, virtually in the centre of the panel, is a manager, technician, an ‘intellectual’. We know this because he’s dressed in a grey suit with a white, open necked shirt and ordinary shoes on his feet. In his right hand he holds a large rolled up piece of paper, a plan or diagram of some kind. He is likewise in profile and is looking out of the right hand side of the panel. His left arm is outstretched in front of him, the palm facing us. He is also, as is the non-working driller, seemingly indicating to someone out of sight. If we could feel his hands we would probably find that they are soft as a baby’s and not calloused as would be the hands of the drillers. And this is an important matter. The artist here is depicting a group of workers as if they are equals, working for a common goal. But the very nature of the depiction shows an inequality amongst them. The technician isn’t getting his hands dirty and has a role that is slightly different from the other workers in the quarry. Overcoming this discrepancy between ‘workers of hand and brain’ was one that no Socialist society has been able to achieve, so far, and would have been one of the contributory factors in their decline and failure. Behind him is a young woman in a red dress who is also in profile, looking ahead of her to the right hand side. She is also an ‘intellectual’. A red dress is not the working clothes in a quarry and she holds a book of some kind in her right hand. Also her long brown hair, free flowing, is not the style of worker. A third office worker, this time another male, is a bit higher up. He wears a white shirt and ordinary trousers and appears to be wearing a red hard hat. His left arm is bent at the elbow and his fist clenched, the hand being at the level of his shoulder. This could be the clenched fist Communist salute but I’m not sure why, in this context. He appears to be looking in the direction of the woman, not out of frame as are so many others. 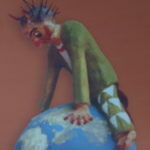 The final figure in the tableau is another worker. He is again in profile and looks out to the right. He’s wearing blue overalls over a yellow shirt and has his left arm high above him as if he is waving to someone out of the scene. His fingers cross the edge of a large circle that is presumably supposed to represent the sun. However, such a large sun would seem to be out of place. Having seen the results of so much political vandalism I am starting to think that there might have been something more relevant to Socialist construction. This space would be perfect for a large red or golden star – both of which would turn an image of a factory into a political statement. Yet another conundrum. Bashkia Mosiac – The Sun? The background to the bottom two thirds of the image is of a quarry. The top third is taken up with images of a factory complex. As the rest of the image shows a quarry presumably this is a factory which works in the cutting and polishing of the stone quarried below. The largest part of the factory is on the left and there appears to be a conveyor belt of some kind to bring the stone up from ground level. At the very top edge of the mosaic is a black gantry. On the right are lower buildings and it would make sense if these were the offices, especially as we have office workers in the rest of the image. That is what is depicted but what they are looking at and what the meaning is I have yet to work out. Who are they waving to out of scene? What is it that is so important that it concentrates the attention of the majority of those on the mosaic? I don’t know if I’ll ever find out the answer to those questions. Did I miss something and there’s a companion piece elsewhere on the building? I’ll have to wait until I have an opportunity to check it out. This is one of the works of Socialist Realism that is ‘signed’, the letters EB appearing in the bottom left hand corner. I have yet to discover what those initials stand for but the fact that there is any indication of the artist on view would seem to suggest this is probably a creation of the 1980s, when the identity of the artists began to appear on such art works. 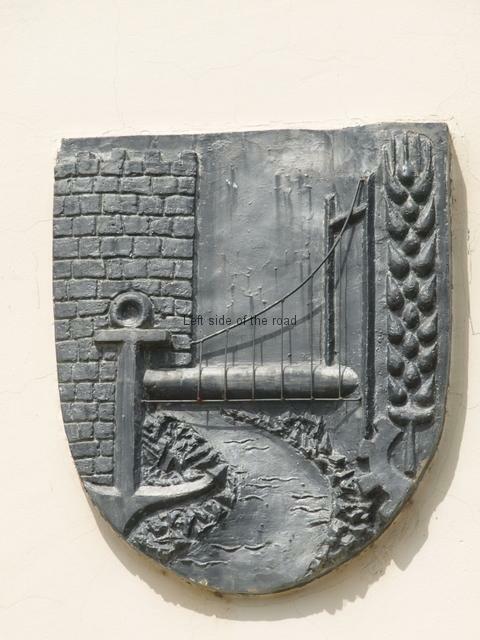 Completing the decoration on the front of the building is the crest for the town. The name of the town, Ura Vajguror means ‘Bridge over the Vajguror River’ and that’s what we see in the centre of the crest. On the left hand edge is a crenellated wall but I’m not aware of any ancient monument near-by (but that’s probably more down to my ignorance than anything else). Strangely at the bottom left there’s an anchor as the town is a long way from the sea and I can’t see any river close by as being navigable. On the right there’s a tall head of corn below which is a small arc of a cog-wheel, representing he collective farms and the factory complexes that would have existed during the Socialist period – all gone now. The Bashkia is located in the centre of the town, on the left hand side of the main road heading in the direction of Kucove (if coming from the direction of Fier). 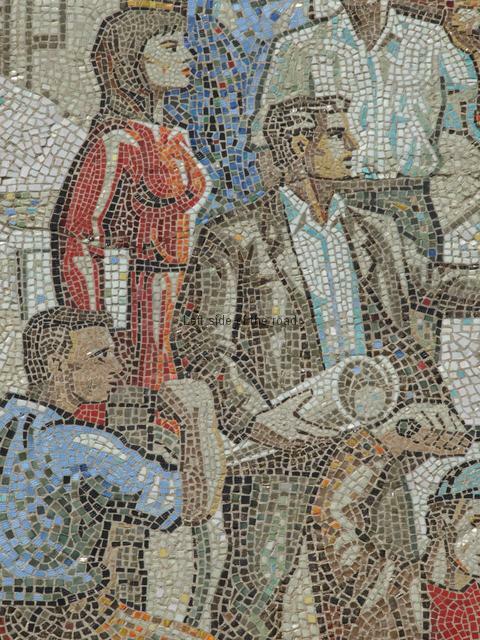 This entry was posted in Albania, Monuments and Memorials, Socialist Realism and tagged albania, bashkia, mosaic, quarrying, socialist realism, stone, ura vajgurore by Michael. Bookmark the permalink. You wrote: “In many ways they capture a feeling of optimism and hope for the future which other art forms just can’t achieve”. So very true. I wonder whether they really achieved this aim. Has anyone written anything about the perception of this kind of art by the ‘common people’ during the Socialist era? Not that I have been able to discover. The only material I have come across is that produced in Albania throughout the 1970s and 80s. This was more a documentation of what had been produced although there were articles in various issues of Albania Today discussing the relevance of art in a socialist society.